Wouldn’t it be wonderful to create a space in the comforts of your backyard to relax and feel at peace? That’s precisely what happens when you create your own Japanese garden. Japanese landscapes are created to be spaces of meditation and reflection. What started as a space made for Japan’s ruling aristocracy to find calm within the storm of their country’s conflict and war, has transformed over time into a way of life and deep-rooted culture. Therefore, it’s not difficult to understand why the idea of a Japanese garden would be an appealing addition to your own landscape. In a world that moves swiftly and creates days that are filled to the brim with stress, having a place to unwind, and even find inspiration is more important than ever. With a little research and the right materials, you too can create a landscape that will offer a slice of peaceful Zen into your life! On their most basic levels, there are two distinct styles associated with Japanese gardens. The first type of Japanese garden, often referred to as Zen garden, is a rock garden that includes the soothing element of sand. This type of Japanese landscape contains no water element and is intended to depict a scene of the inspirational mountains and rivers of Japan. Wait! Didn’t you just say there are no water elements in this design? That’s right, no water. However, the sand and gravel are raked into a particular pattern that’s meant to symbolize the river, while rocks placed on the sand signify the mountains. The result is a peaceful homage to the inspirational mountains and rivers of Japan. The next style of Zen garden you can design is referred to as a moss garden. Lovely, soft moss flourishes in Japan’s naturally humid and rainy climate. Zoysia grass replaces moss easily and is much easier to grow in this climate. Adding zoysia grass to your garden will establish a soft and balanced feeling that is known to comfort a burdened mind, body and soul. It will create natural varying heights to your Zen garden making it look so authentic. While each of these gardens is a representation of Japanese culture, your Japanese Zen garden can be a combination of the calm that speaks to you. Whether you decide on a rock, zoysia grass or even a peaceful pond in your garden, the purpose of your Japanese garden is to create a space that achieves your personal Zen. If your goal is to create an authentic Japanese garden, it may require a little education and research to remain loyal to the culture of its creation. We often feel tempted to adhere to the traditional ideas of what the garden should look like, with bright, colorful flowers. However, many of these preconceived notions tend to come from Chinese culture. Additions such as red hanging flowers and bridges covering small streams are all descended from ancient Chinese traditions but are often mistaken for Japanese. Sure, many of these features have influenced Japanese gardens over time, but a true replica of a Zen garden will not contain flashy or bright colors. Instead, a traditional Japanese garden incorporates monochromatic green, which is used to create the primary landscape palette. When it comes to incorporating flowers into a traditional Japanese Zen garden, they are not completely out of the question. It’s just important to understand their role in the garden and your journey towards achieving Zen. Flowers can be colorful, but they should not be so bright that they become distracting. Above all, the Japanese traditions incorporate flowers that work towards highlighting the green that serves as the balancing color of your peaceful Zen garden. Additionally, the arrangement of your garden serves as a key aspect to achieving an authentic Japanese garden. The thought process behind a Zen garden comes from understanding that every little detail is a symbol. The total sum of the landscape is intended to work towards creating Zen, which means that every detail serves a purpose. Creating a Japanese garden is not an exercise in creating the biggest and the best! So once you decide to create a Japanese garden, you must first set aside any notions of glitz and glamor. Zen gardens are a testimonial to simplicity and purpose. More often than not, keeping your design simple and small works best towards achieving a successful final space. Start by using materials that include simplicity. For example, a bamboo fence that serves as your garden’s perimeter is a natural and simple way to enhance your garden’s design. This renewable resource (bamboo) will effortlessly add a natural element to your garden. Another peaceful aspect to enhance your garden is found in using small stone pathways that wind past stone statues or icons that speak to your goal of Zen. These winding stone paths adhere to the Japanese belief of anticipating what’s waiting in the future while simultaneously respecting and honoring your past. Isn’t that a wonderful way to view life? Understanding the ancient foundations of a Japanese garden is the best way to start with your personal Zen landscape. While this traditional garden does take some time to get just right, the benefits of a Japanese garden are well worth it in the end. 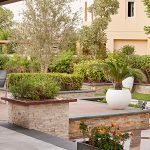 Not only will you have a space that produces peace of mind, but you’ll create a garden with a purpose that is based on a deep-rooted cultural history. It’s time to experience your Zen! a 'Milestone' in their life.